We have 9 cabins to offer lodging for up to 80 people, we also have lodging for people with special abilities. Monte Real is the place where we can leave our worries and relax in a friendly and homey atmosphere. In our hostel you can enjoy a silence and unique landscapes, to relax and relax from the daily worries. We offer a place where you can measure your fears, a swing with more than 60 meters of pendulum. Come and meet our hostel, a quiet, relaxed place, with affordable prices, clean and tidy. In Sacha Waysa you will find ancestral practices that will make you go back in time, and coexist with the ancestral Ecuadorian Amazon. Our Hostel is located in the quietest neighborhood of Baños, directly in front of the La Virgen waterfall. In our kennel you can enjoy our deer company, and children can play with them. Cuenca, officially Santa Ana of the Four Rivers of Cuenca, is an Ecuadorian city, head of the canton Cuenca and capital of the province of Azuay, as well as its largest and most populated city. It is crossed by the Tomebamba, Tarqui, Yanuncay and Machángara rivers, to the center-south of the inter-Andean region of Ecuador, in the basin of the Paute river. It is called "Athens of Ecuador" for its architecture, its cultural diversity, its contribution to the Ecuadorian arts, sciences and letters, and for being the birthplace of many illustrious figures of Ecuadorian society. It was founded on April 12, 1557 on the ruins of the Inca city of Tomebamba and the city cañari of Guapondelig, by Gil Ramírez Dávalos, under orders of the Viceroy of Peru Andrés Hurtado de Mendoza. The Historical Center of the city was declared a Cultural Heritage of Humanity by UNESCO on December 1, 1999. In the center of the city there are important historical vestiges: museums and ancient churches (such as the Cathedral of the Immaculate Conception, one of the largest in America, and others dating from the sixteenth and seventeenth centuries), cobbled streets and houses with Republican style facades that show European architectural influences, especially Spanish and French. Characteristic are the balconies, artistically carved ceilings and other painted brass forges. The city is also known as the "Cuenca de los Andes" or the "Athens of Ecuador" because it is the city of origin of several historical poets and personalities such as Miguel Vélez, Gaspar Sangurima, Santo Hermano Miguel, Honorato Vázquez, Remigio Crespo Toral, Abdón Calderón Garaicoa, Antonio Borrero, among others. In Cuenca, it is the seat of numerous cultural organizations. How to get to Cuenca from Quito? In the Terrestrial Terminal of Quitumbe you can take the following companies that travel directly to Cuenca: Express Sucre, Imbabura Fleet, Jahuay, Panamericana, Homeland, Loja Internacional, Santa, International Travel, Oriental Tourism, Super Taxis Cuenca, Oriental Tourism. Approximate distance via land 465 km, travel time 8 hours. How to get to Cuenca from Guayaquil? In the Terminal Terrestre de Guayaquil you can take the following companies that travel directly to Cuenca: Executive San Luis, Express Sucre International, Oriental Tourism, Super Taxi Cuenca, Super Semeria. Approximate distance by land 202 Km, travel time 4 hours. Cuenca stands out for its cultural activity. 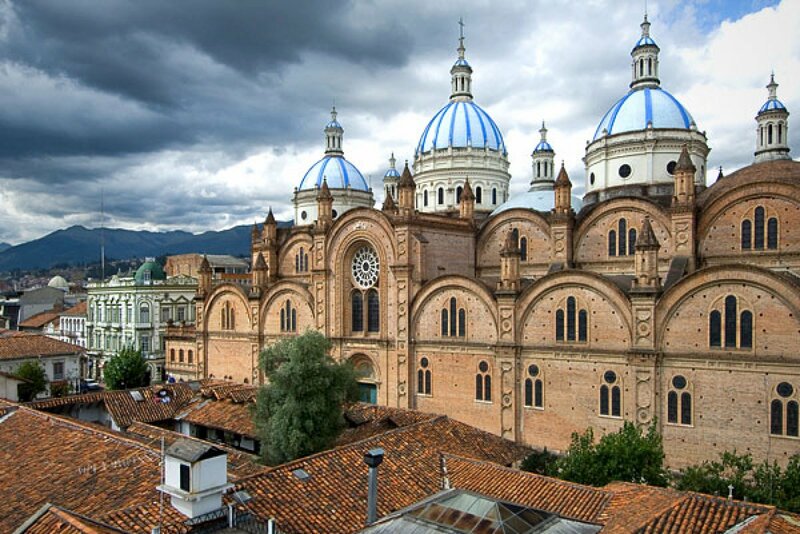 The city is home to several international festivals such as the International Festival of Stage Performing Arts of the World, the La Orquídea Film Festival and the only official plastic arts event in the country, the Cuenca International Biennial. There is an expression in the colonial documentation "mestiza in habito de india", used to designate the chola. "The term chola continues to be a subject of study, since its origins as well as its connotations vary from one region or city to another and even within these with the passage of time"
In the following decades, it practically disappears in the documentation and it is not until the last third of the XCII century that its presence in the notaries is frequent, doing it in the transactions of lands or houses or intervening directly as a buyer or seller. Skirt, embroidered blouse, ikat cloth, hat, and patent leather shoes identify the emblem of our city. SOMBRERO: The chola cuencana that comes from the field wears straw hat, hand knitted, high cup, short wing and black headband, the one that comes from the city usually does not wear a hat. ZARCILLOS: Adornment that prints social prestige. The most traditional designs are: palms, wings of birds, birds and candongas, all worked in gold with pearls, emeralds, rubies, and natural stones. Candongas are large crescent-shaped earrings with a gold edge and black enamel inside. CLOTHES: Known as "Gualaceo cloths" they are a boast of traditional craftsmanship. The blanket - the woven part - is adorned with ikat designs, that is to say with designs obtained from the contrast between the dyed and non-dyed parts. There are old, silk cloths. Nowadays they are made in wool or cotton. POLLERAS: There are two, the interior or "center", usually with strong colors such as "aromo", "key rose", "ounce of gold", and red, on its lower edge it has multicolored embroidery in the form of garlands and ornaments with sequins. On the "center", that is, externally, the most serious pollera bag is used for its color and design. Ruins of Ingapirca: Located 80 kilometers from the city, they correspond to the most important archaeological complex in Ecuador, formed by a set of Inca ruins that would have functioned as a place of worship and veneration to the sun god, raised 500 years ago on a first Canarian settlement. .
Its most important site corresponds to the imposing Temple of the Sun, a structure of ashlars padded and overlapped on an elliptical plant of 37.10 meters long. A set of staircases, foundations and labyrinths of walls of old structures that intermingle with the greenery of the landscape, end by complementing the extraordinary scenery. Amaru Zoo, has a collection of 120 species of animals such as: amphibians, reptiles, fish. Parish of Baths: Located 8 kilometers from the city, it corresponds to one of the touristic places of Cuenca, unforgettable to relax and rest, being a place recognized for its thermal waters of natural origin with mineral properties. Although it is a small town, it has numerous spas and hostels where swimming pools, Turkish baths and saunas are located. They complement the attractiveness of the place its restaurants of typical gastronomy. Remigio Crespo Toral Museum. It has more than 18,000 archaeological pieces and nearly 700 pieces of colonial art, as well as a collection of documents and objects of historical importance on the city. Municipal Museum of Modern Art. It works in a building built in 1876, which was the old House of Temperance and where also operated a school, the prison for males, rehabilitation center for alcoholics, etc. This museum is one of the main venues of the Cuenca Biennial. Museum of the Old Cathedral. It is a museum of religious art with pieces and liturgical objects that date back several centuries, as well as a model of the initial design of the New Cathedral or the Immaculate Conception. Pumapungo Museum. Formerly known as the Central Bank Museum, it is now administered by the Ministry of Culture. It dates from the early 80's. It is located next to the Pumapungo Ancestral Park ruins. It has a national ethnography room, an archaeological room, a conservation and restoration room, archeology and modern and contemporary art reserves, a historical archive, library, ethnobotanical park, avifauna rescue center, five temporary exhibition rooms and a room for emerging artists. Museum of the Concepts. It is a museum located in the Monastery of the Concepts that exhibits historical pieces that show the life of the young women who entered the convent to be trained in their religious life as well as the daily life of the resident nuns of the Monastery. Museum of Aboriginal Cultures. It has more than 8000 archaeological pieces. Museum of Identity Cañari. It has several archaeological and artistic pieces about the Cañari culture. Museum of the History of Medicine Guillermo Aguilar Maldonado. It works in the old School of Medicine of the University of Cuenca. Museum of Popular Arts (CIDAP). Founded in 2004, the museum has about 7,000 pieces of collection, which include crafts from various Ibero-American countries. Straw Hat Museum. Straw hat (Carludovica palmata) also known as panama hat are a typical element of Cuenca, which is among the leading manufacturers of this type of hat. Hat House Economuseo. It is located in a house that worked as a hat factory and was recovered by the Municipality. It has four permanent exhibition halls. There are also shops selling toquilla straw hats. Museum of Jefferson Pérez. He has more than 200 photos of the named Olympic champion, winner of the gold medal in the 20 km march of the 1996 Olympic Games. Fire Land and Arts Museum. It is located in the House of Chaguarchimbana, one of the heritage buildings of the city. Its name means "Shallower place of the river", because it is located in one of those points, on the bank of the Yanuncay River, one of the four rivers that cross the city. The Historic Center of Cuenca is one of the attractions of the city and one of the most important due to its buildings with colonial and republican architecture of Spanish and French influence, its squares and parks, museums and art galleries, among others. In this part of the city you can clearly see some buildings that have not had major changes in several centuries and are maintained as part of the cultural heritage of the city. Many tourists enjoy this space traveling on foot or in one of the tour buses. Carmen de la Asunción: located next to Plaza de las Flores, it was built around 1730 and represents the religious architecture of the colony. San Francisco: was built by the order of the Franciscans on their arrival in the city and almost completely remodeled in 1860. Todos Santos: it was built in 1924 in the place where, centuries before, the first provisional chapel of the city was located, there the first mass was celebrated in the city after the arrival of the Spaniards. Church of San Blas: the original church was built at the beginning of the colony using materials from the ancient Inca city of Tomebamba. The current church was built in 1935 but retains the same base as its predecessor. Santo Domingo: is the second church in size after the New Cathedral, began to be built in the 1820s and completed in the 1930s. Las Conceptas: its construction dates from the beginning of the 18th century and is notable for its façade with a large belfry (wall adorned with niches or niches and ending in a belfry) and in which there is no entrance door. The two entrances are located on its side and in them you can see beautiful carved wooden doors. San Sebastián: its construction dates back to the 19th century, being one of the limits of the city of that time. San Alfonso: also known as the Basilica of Our Lady of Perpetual Help, was built in the year of 1875. Turi Church: built next to the Turi viewpoint, it can be seen from a large part of the city, especially at night thanks to its lighting. Bronze Virgin: So called because of a statue of the Virgin Mary made in bronze that is next to the original church. El Vergel: It is a small church, rebuilt due to the destruction of the original chapel by a river Tomebamba crescent. Chancho muerto.- This traditional dish of the sector is desired by locals and foreigners. It is characterized by its cascarita, fritada, sancocho, morcillas, it is served with mote and toasted, a real delicacy to savor. Cuy asado.- is one of the most traditional dishes in the Austral region, and is considered exotic for foreigners, who are attracted at the end by its exquisite flavor. He who eats it with his hands, once he is divided into prey. It is served with potatoes, mote, lettuce and a drink. Rosero.- It is a typical Cuenca drink that is made with corn, fruits and spices, it is the perfect accompaniment to any other typical dish of the city. Desserts.- Tortillas with morocho, red or a hot chocolate, a sandwich that is tasted in several areas of the Austro. We can find them corn, corn and wheat.